The continuing education courses are offered as Self Study and Classroom programs. Self Study programs can be taken anytime and are completed at your convenience in your home or office. We will mail you the course supplies which include study materials and test booklet. Courses must be successfully completed within 90 days of registration. Self Study courses are typically three (3) and four (4) hour courses. The Classroom programs are typically one (1) day and meet the required seven (7) hours of continuing education credit. Per Indiana Department of Insurance, IDOI, the Final Assessment is a closed book exam and needs to be proctored/witnessed by another licensed insurance agent in Indiana. You and your proctor/witness must fill out and sign the Affidavit of Personal Responsibility. Upon completing this course, the student will understand what professional ethics mean to the title insurance industry. Participants will be able to discuss ethical practices in the marketing and selling of title insurance. 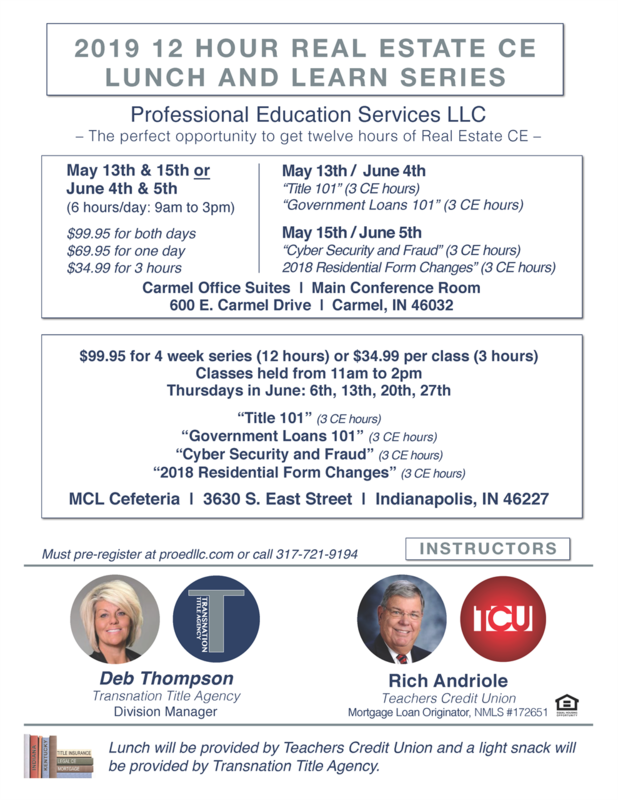 The Title Insurance CE is a one (1) hour class and has been approved by the Indiana Department of Insurance. Online - You Can Take Now or When You Are Ready. Go at Your Owe Pace. Upon completing this course, the student will have obtained comprehensive explanations of why title insurance is important, who is involved in the title insurance process, and what documentation is necessary. Participants will be able to discuss common misconceptions about the title industry. In addition, the participant will be able to recognize several forms and documents from the American Land Title Association. COMPLETLEY ONLINE "TITLE INSURANCE 7 HOURS CONTINUING EDUCATION COURSE"
Upon completing this course, the student will have obtained comprehensive explanations of why title insurance is important and who is involved in the title insurance process. The Title Insurance CE is is a three (3) hour class and approved by the Indiana Department of Insurance. Upon completing this course, the student will have obtained comprehensive explanations of the Indiana Department of Insurance Rules and Regulations. Upon completing this course, the student will have obtained comprehensive explanations of why Notary Public is important, the rules of Notary Public, and what documentation is necessary to notarize documents. The Title Insurance CE is is a four (4) hour class and approved by the Indiana Department of Insurance. Don't miss this great opportunity, sign up today! If you are an attorney.... An attorney in good standing who is admitted to the practice of law in Indiana and holds a license issued under IC 27-1-15.6 with a title qualification under IC 27-1-15.6-7(a)(8) may complete all or any number of hours of continuing education required by this subsection by completing an equivalent number of hours in continuing legal education courses related to the business of title insurance or any aspect of real property law.